Carlton Harlow Graves (d. 1943?) started operating his Universal Photo Art Company in the early 1880’s and eventually started offering pirated views of Japan on buff/tan-colored flat mounts possibly in the late 1890s. Looking to enter into the market dominated by Underwood & Underwood’s “Strohmeyer Set,” Graves hired an unexperienced stereo-photographer, Herbert George Ponting (1870-1935), to expand and establish his company’s Japan portfolio. Having only turned a professional photographer a year before, Ponting arrived in Japan around the fall of 1901 and photographed the scenery of Japan into early 1902. This was the first of at least five extended stays over the next five years for Ponting who would go on to work for three different seteroview publishers in his short career. Graves decided to use Ponting’s images as the base for a massive 200-view series on Japan, unprecedented in size given that only 72-view sets of Japan were issued at the time. It would be several years before other publishers would offer anything of a similar scope. This was the first and only time Ponting worked for Graves, but the portfolio of Japanese images Ponting would build over the next few years would increase his reputation significantly, ultimately allowing him to be invited as the official photographer for the ill-fated British Antarctic Expedition of 1910-13. On the eve of leaving for the expedition in 1910, Ponting published his reminiscences of his stays in Japan as In Lotus-Land Japan, profusely illustrated by his own photography. The lowered heads of the men mirror that of the Daibutsu, who in turn softly gazes down at them, creating an atmosphere of solemnity, possibly even penitence. The garments worn by the men create a strong contrast and the bold design keeps bringing the viewer’s eye back to their reverent posturing. The foreign-looking crests on their backs remind the viewer that they are not Western tourists. The clothing is traditional festival wear (happi 法被), and it remains unclear if Ponting was entirely fortunate to be photographing on the day of a festival, or if he hired the men to don the festive, bold attire; though I suspect the latter. 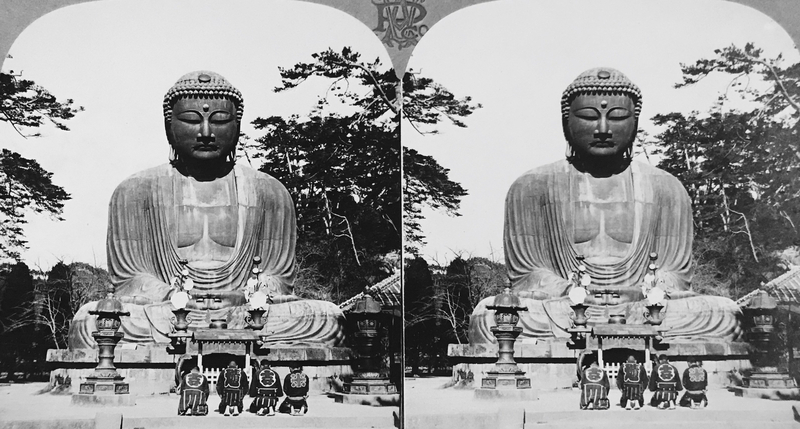 In other regards, the images is fairly standard, taken from almost the same frontal position as Strohmeyer’s version, but cropped more tightly around the Daibutsu, who in turn becomes more centered. By having the men kneeling, an illusion is created whereby the perfectly centered Daibutsu appears larger, almost as if determining the fate of the men.